The beautiful city of Siena retains an ancient and mysterious atmosphere floating through the little, narrow streets and squares. Draped on its three hills, Siena is a very beautiful city to visit, a flamboyant medieval ensemble of palaces and towers cast in warm, brown, siena-colored bricks. Its soaring skyline is its pride, dominated by the Gothic Cathedral (Duomo) and the taut needle of the Torre del Mangia, and yet the shell-shaped Piazza del Campo probably captures the most attention and fame. Your local guide will lead you on a discovery of some of the highlights of Siena. After visiting Siena you will have a chance to taste Chianti wine. 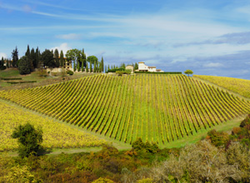 Chianti is a vast hilly area in the center of Tuscany, between Siena and Florence. The area continues its ancient agricultural tradition. The name “Chianti” is said to derive from the Latin “clangor” which stands for “sound of the trumpet”: referring to the noise produced by the instrument anciently used during hunting parties in this territory. Duration 10.5 hrs - Transportation: A/C Deluxe minivan/coach - Entrance fees: Included at the Cathedral in Siena - Walking Information: Extensive walking involved. Siena is full of steep alleys and steps. - Shopping: Some free time for shopping in Siena - Lunch: N/A but wine tasting is included at the farm that will be visited in the afternoon. An interesting tour taking in some of the most famous sights of the Roman Empire. You will pass by the Pyramid of Caius Cestius, the grandiose structure housing the tomb of Caius Cestius, praetor and tribune of the people; the Circus Maximus, the greatest stadium used by Romans for horse-racing contests, the Palatine Hill, where according to the legend Romulus and Remus were raised by a she-wolf. From Colle Oppio you will admire the Colosseum, the symbol of the Eternal City: built between 75-80 A.D., it represents the eternity of Roman civilization. With its three superimposed classical orders, this monument is no doubt a masterpiece of classical architecture. 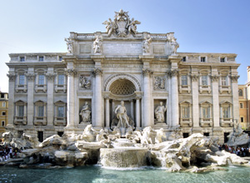 When you admire the Trevi Fountain, don’t forget the tradition of tossing a coin into the water and making a wish. Duration: 10 hrs - Transportation: A/C Deluxe minivan/coach - Entrance fees: N/A - Walking Information: Extensive walking involved. Rome is not a wheelchair friendly city. - Shopping: Free time for shopping - Lunch: Included in a local restaurant. 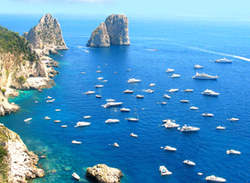 Capri is a beautiful island of limestone rock just off the Sorrentine peninsula whose coastline is marked by several caves and reefs. With its picturesque landscape, surrounded by the Mediterranean Sea, it caters to those who want only the best. The island is rich in history and myth. Its steep cliffs, gorges, caves and turquoise water instill a feeling of wonder. From here, one can easily explore the exclusive shops and admire the fashionable clothing, jewelry and antiquaries. Duration: 7.75 hrs - Transportation: Jetfoil / Minibus (not air-conditioned) - Entrance fees: Included at Villa San Michele - Walking Information: Extensive walking involved - Shopping: Some free time for shopping - Lunch: Included in a local restaurant. At the time of the famous eruption in 79 AD, the volcano Vesuvio had been inactive for over 800 years. On one beautiful afternoon in August, however, the peaceful mountain would rouse from this slumber in the first of two massive eruptions that would destroy Pompeii and the neighboring towns of Herculaneum and Stabiae. The ash that buried the town served to “freeze”, “mummify” or “crystallize” the entire city. The ruins (including buildings, artwork and other artifacts) are extremely well preserved, and offer a fascinating snapshot of Roman life in the first century AD. 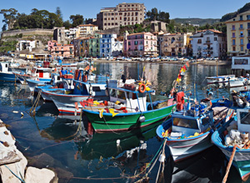 Land of colors and fragrances, birthplace of Torquato Tasso, retreat for artists and writers such as Caruso and Wagner, who found inspiration in this splendid corner of Campania. The Sorrento Peninsula and the Amalfi Coast host an enticing pageant of blue seas, jagged coastlines, lush hills and delightful towns. The “Amalfi Drive” overlooking Positano is said to be the most spectacular road in Europe: the winding cliff top road offers breathtaking panoramic views at every bend. Each spot is a world which dazzles the imagination and inspires unforgettable impressions. Duration: 8.75 hrs - Transportation: A/C Deluxe minivan/coach - Entrance fees: Included at Pompeii excavations - Walking Information: Extensive walking involved on uneven ground. Comfortable shoes recommended - Shopping: Some free time for shopping on the Amalfi coast. Mainly souvenirs outside of Pompeii excavations. - Lunch: Included in a local restaurant. This tour will begin from St. Mark’s Square, which was the political and religious center of the city during the period of the Serenissima Republic. You will visit the Doge’s Palace (private residence of the Doge, seat of government and court of justice) and pass over the Bridge of Sighs, a covered passage over the canal between the palace and the ancient prison. The Cathedral of St. Mark, built on the plan of a Greek Cross to house the body of St. Mark, which had been smuggled out of Alexandria, is the second stop on the tour. At the end of the visit free time for shopping or for a coffee in one of the well known cafés enjoying the music of their orchestras. 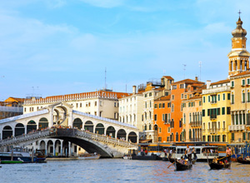 Duration: 4 hrs - Transportation: Private motor launch and on foot - Entrance fees: Included at the Doge’s Palace - Walking Information: Extensive walking - Shopping: Some free time for shopping - Lunch: N/A. Arrive in Murano, well known for the particular quality of the glass which has been produced here for centuries. In the 16th century many nobles had palaces with fine gardens built here and they also obtained from the government of Venice special privileges because of the important glass production. You will visit an important glass factory and there you will see how a master prepares his works of art. You will then proceed to Burano Island. 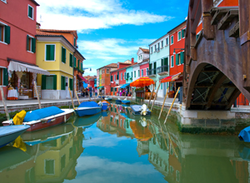 Burano’s unique atmosphere comes from the brightly colored houses situated along the canals. The Island is well known for the art of lace-making. Your last stop will be Torcello. In the middle of Torcello stands the Cathedral and the interesting Church of Santa Fosca. Duration: 5 hrs - Transportation: Private motor launch - Entrance fees: N/A - Walking Information: Moderate walking - Shopping: Some free time for shopping in the islands visited - Lunch: N/A.